On a hot afternoon, a Feral Pigeon was cooling off by taking a shower in the shade of a bush in the Flower Walk. 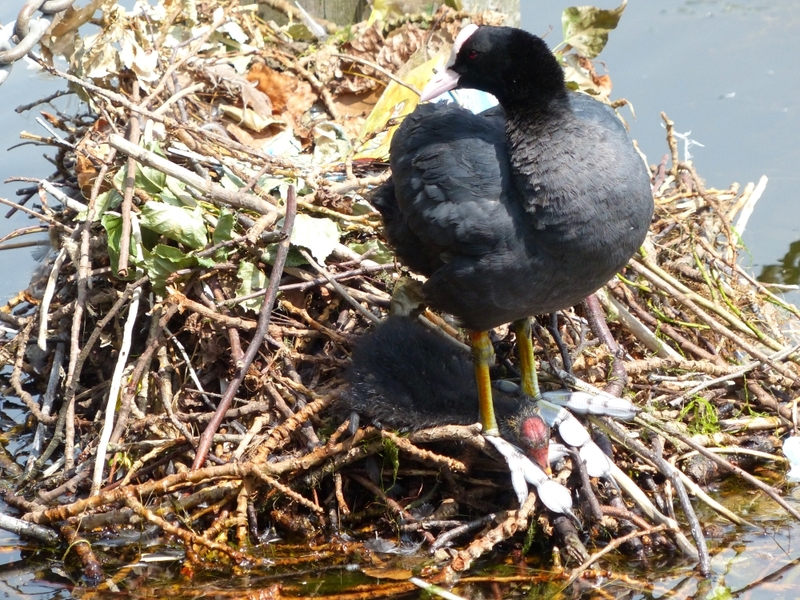 The Coot chick in the nest near Peter Pan was sheltering in the shade of its mother. 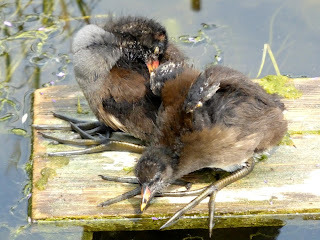 But these Moorhen chicks in the Italian Garden pond were sitting unconcernedly out in full sunlight, with their extraordinarily large feet stretched out in front of them. They are resting on their tarsi, the joint that corresponds to a human heel. 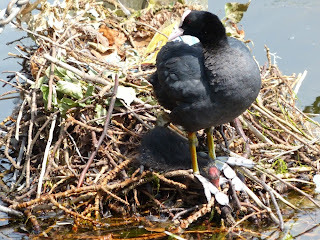 If a human were in this position, he would be standing up, but for a Moorhen it is sitting down. 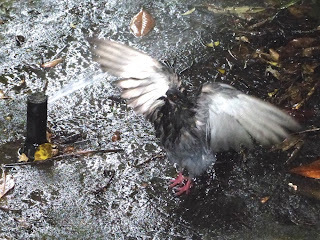 There were three Hobbies calling in a tree on the Serpentine island, on widely separated branches so it was possible to be sure of the number. I tried hard to see them with binoculars, but they were completely hidden by leaves. Probably they were on the sunny side of the tree, facing away from the shore. There are a lot of dragonflies over the lake, a favourite food of Hobbies. Both the Great Crested Grebes' nests on the Long Water are still occupied, and we are all hoping that they succeed after so many false starts. A few Cormorants have returned to the lake, a sign that there is still a useful quantity of medium-sized fish, as Cormorants don't bother to turn up if there is nothing to eat. You often see single Cormorants flying over the park, and I sometimes wonder whether these are scouts, and will bring others if they find enough fish. Since Cormorants often fish in packs, it is not too fanciful to guess that this is so. This butterfly is a Small Tortoiseshell, Aglais urticae, a common British species but none the less fine looking for that. Urtica is Latin for nettle, so it is living up to its name by sitting on one. 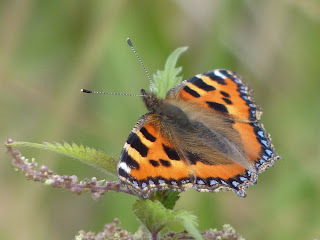 Lovely study of the Small Tortoiseshell. I saw my firs for the year in Wisley RHS gardens last Thursday. And on Friday Hampstead Heath was full of Meadow Browns.